E*TRADE encourages people to take charge of their financial future and invest with E*TRADE in a new hilarious ad. 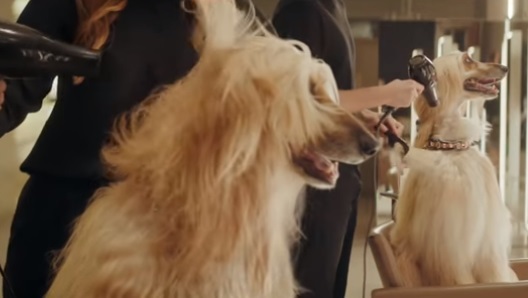 The 30-second commercial features a variety of dogs living the high life – one is riding a motorboat, another one is having a coffee at a lavish coffee shop with a view, another one is having its hair blow dried at a hair saloon, a bunch of chihuahuas are seen hanging out in a luxury store of designer bags, another small dog is seen getting a massage, a “couple” of dogs are seen at a table, by the sea, waiting to give their order to a red-haired curly waiter, who – acknowledging that there are dogs with better lives than his, gets E*TRADE and starts trading. The spot, set to the tune of George Clinton’s “Atomic Dog (Special Atomix Mix)”, ends with the voiceover saying the company’s tagline, “Don’t get mad. Get E*TRADE”.